The locals didn’t even know you existed… and you’ve been in business for how many years? Don’t just “post and pray“—Set up your Facebook Business Page to be memorable, collect leads and gain instant credibility. 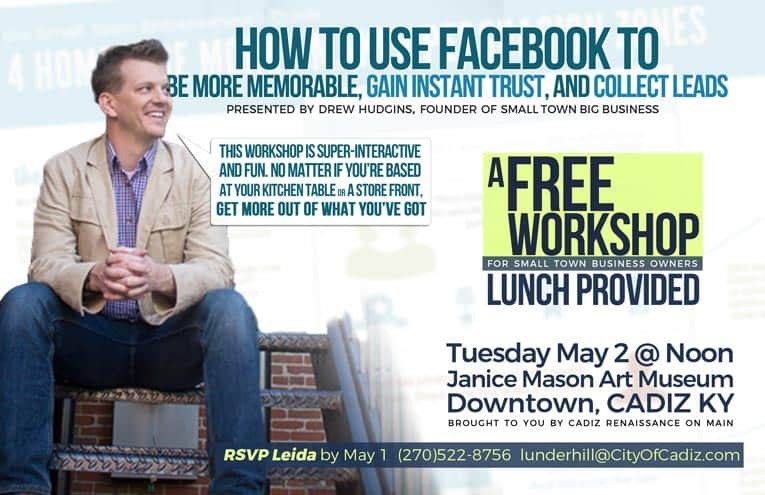 Drew’s created print and online marketing campaigns for years… now he teaches small town biz owners all those lessons so they can use the internet to get more traffic and sales. Take the wrong way?! Shyooot! I could barely hold back the Nicholas-Sparks-end-credits sobbing! I miss those kids (in case you had no idea, I used to be a band director—and taught kids how to hit stuff as musically as possible. Ahhh, stories for other times). Anyway, I’m sharing here: I get to teach tomorrow in my historic small downtown. If I prepared some fancy speech, I’d get all nervous and my right arm pit would sweat profusely, about 10x more than my left. It’s odd. It might be something to get checked out. Maybe. I don’t guess I technically know what a “think tank” is but it sounds like it’d be something close to these workshops. If you’re close, consider yourself invited! Take a look at that flyer. Does anything pique your curiosity specifically? I’ll hit you back with something. Now, I’d like YOU to share something. What’s been the best thing you’ve ever done on Facebook? (It can be big-time engagement you got from a post or an ad, a contest, or just take the opportunity to link to your beautiful page).